Kick artist's block to the curb with a night or two in one of these Airbnbs. Whether you're a web animator, a graphic designer, a book illustrator, a budding musician, or freelance writer, you've inevitably encountered artist's block. Sometimes, feeling creatively deprived can last for a few days. Other times, it can last for weeks, months, and in rare cases: years. You can try to wait it out, or you can take matters into your own hands and find your own inspiration. Luckily, there's no better way to fuel your creative energy than to uproot from your status quo and place yourself in an artistically thriving space. When Owen Wilson's character in The Royal Tenenbaums said, "I always wanted to be a Tenenbaum," did you whisper, "me too"? Live out your own whimsical Wes Andersonian fantasy in this tribute home in Picton, PEC. Each room is designed as a love letter to a different film: Moonrise Kingdom, Fantastic Mr. Fox, and of course The Royal Tenenbaums. Rise and shine in Margot's bedroom. Sip teas in The Darjeeling Limited kitchen. Catch some Z's in Steve Zissou's living room. Get inspired in Mr Anderson's House (and some serious Instagram fodder while you're at it). This totally groovy Cozy Artist's Workshop is the ultimate musician's retreat. Spacious, soundproof, and robed in tapestries, you'll be tapping into that musical sweet spot in no time. This artist's lair also has its own private bathroom and shower —perfect for taking a quick rinse after a major rock n' roll sesh. Whether you're here solo or with your band mates, this Airbnb is bound to drum up some killer new tunes. Creativity rarely exists in isolation. Collaboration with others fosters new ideas, spurs interesting discussion, and leads to bigger and bolder projects. That's why we love The Gathering Spot, a well-lit and organized spaced that can accommodate groups as large as 14 people. Round up the team, get your thinking caps on, and make your way over to The Gathering Spot. Is this the real life? Is this just fantasy? Answer: both. Named after one of the greatest songs of all time, Bohemian Rhapsody, you know this Airbnb in Niagara Falls, ON isn't kidding around. Vintage and quaint, this charming home houses tons of books, boardgames, and vinyls to help transport you far, far away from the thrum of city life. Easy come, easy go. Step back to the 1960s in The Time Warp (don't know about you, but we've got the Bewitched theme song stuck in our heads already). 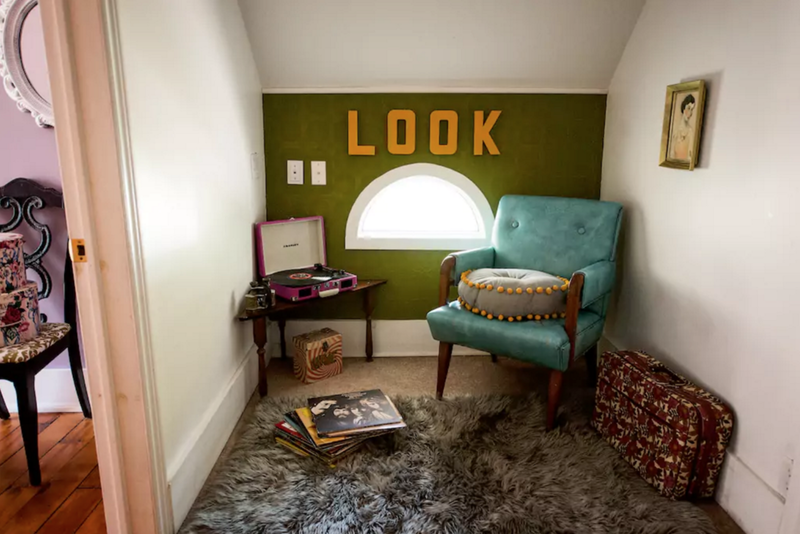 From the milky-mint walls to the retro mustard-yellow TV, draw inspiration from the throwback decor, the vintage boardgames, and the classic records (maybe it'll even make you consider leaving the cell in the side table drawer...). We're not quite sure who Mimi is, but were glad she's MIA. If The Time Warp is a little too dated for your liking, this contemporary home will be right up your alley. With an aqua blue paint job and bold pops of green and orange, this colourful casa is bound to spark new life into a creatively stagnant project. Drenched in soft pale yellows and powder blue accents, The Oakie Doakie Suite is the ideal pad for the crafty creative. With its oak floors and simple decor, this Airbnb is perfect for DIY-ers and artists that need space and an abundance of natural light to get work done. The County Queen is a lovely home that frankly reminds us of a space a grandma would live in...and by grandma we mean someone as charming and classy as the Queen of England herself. The offbeat mix of rectangular and circular mirrors hung above the mix 'n match furnishing is like beautiful display of a thrifters' favourite treasures. If you find yourself responding to compliments with "Thanks, its vintage," you'll go ga-ga for this perfectly curated gem of an Airbnb.